The Brinyte BR01 LED flashlights are by my estimates, maybe 1.5 to 2 times brighter than the Ultrafire 501Bs that I reviewed earlier. The Brinyte BR01 operates on one 18650 battery or two 16340 batteries and is available in green or red LED. The BR01 throws a nice tight beam which makes it a good shooting light for predator hunting or night calling. The Brinyte BR01 is a very well built LED flashlight and for around $27 is a good choice for the budget conscious predator hunter. Considering it is only about $17 more, the BR01 is a much better quality light than the Ultrafire 501B yet it is still much less than a lot of the other “coyote hunting lights” out there. The BR01 has a 2-mode clickie type tail on/off cap switch. The two modes are low and high beam. Once the light is turned on by fully depressing the tail cap button, you can switch between high and low modes by lightly (and silently) tapping the tail cap button. Voltage Input: 2.8~18V, 18V Max. 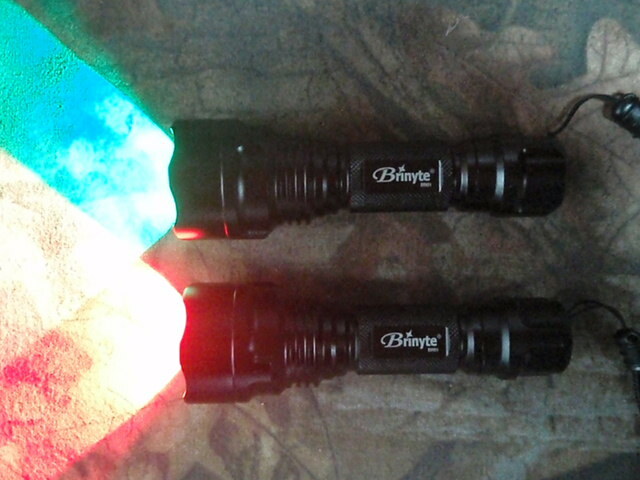 Brinyte BR01 lights are available in either red or green LED from DealExtreme for about $27. For $27, the Brinyte BR01 is a well built LED light and makes a good predator hunting light for the money. 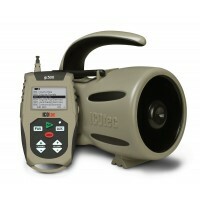 The Brinyte BR01 is a good choice for a shooting light, scope or gun light. It throws a tight spotlight type beam surrounded by a halo. If you are using it as a shooting light, just add an easy to make halo shroud and you’re good to go. Hi. I recently bought the Brynite BR01 (in red LED) you recommended. I noticed it got pretty warm when running it on high. is this normal? I am just being cautious since I have read a little bit about the dangers of these 18650 batteries. It does not get warm on low power, just on high power. It is not too warm to handle but it just feels unusually warm. Yes, the BR01 gets a bit warm, but all the lights I have that use 18650 batteries get warm. Even the LED lights in the headlamps that use the 18650s get warm and the batteries are separate from the lamp part. Do you know of a remote tail cap switch that works for the Brynite BR01? I really like it for ratting when used with a DIY scotch tape diffuser but could use a remote switch. Any Pressure Switch that serves this flashlight at dealextreme site?